It’s time to collect more information faster, give feedback quicker, and collect more data ever. I’ll let you in on a little secret. Google Forms will make your life easier, give feedback instantly, and collect more data than you ever thought and you will spend much less time doing all these things. Sounds great right! Just keep reading and I’ll show you how it can be done! In this first blog post, I’ll show you how to make a Google Form (after a few tries, you can make them really quickly). In my second blog post, I’ll give you ideas on the best uses for Google Forms in education. 1. Create a form in Google Drive – Go to drive.google.com or just enter your your google domain and find the your google drive. 2. Adding Text Boxes – Use the text box to collect any short text data. I usually use this for student names, email, etc. Plan your form accordingly to how you want your responses to look (last name / first name). Think of all sort features, because this is what makes Google Forms powerful. If you can’t easily sort, then it takes longer to process your data. 3. Adding Paragraph Text – Use the paragraph text box to collect any longer text data. More for journaling, answering thought provoking questions, etc. This is a response that can’t be graded, but usually your students will give you awesome information here. 4. Checkboxes – They are a great way to collect data that you may want students to choose many different options. The responses are great because you can see how many responded and what the percentage of respondents was. 5. Choose from a list – The choose from a list feature acts like a multiple choice question. This lets respondents only choose one of the options you offer them. There is no “other” selection under this feature. I really like this question type for what “hour” the class is or what “homeroom” teacher they have. This really makes sorting easy when looking through the responses. 6. Multiple Choice Questions – This is one of the most popular selections with Google Forms. It will give you the same pie chart as choose from a list, but the respondents will see all their choices without having to click. It also gives you the “other” option, where a student can type in their choice. 8. Adding Images – Great way to add a visuals for your students. Very simple to add them into the Google Form. Just select add image, find your image, and select. Then add questions below. 9. Adding Videos – You can only use YouTube clips for your videos. You can search through YouTube for the videos you want to use or you can paste in the url of the video you want to use. You can have students watch videos for assessments or even flip your lessons, so your classes watch at home and answer questions about what they watched so you know they really watched them. It’s as easy as that! Once you practice making a few simple Google Forms please check back and read part 2 of using Google Forms in Physical Education blog series. 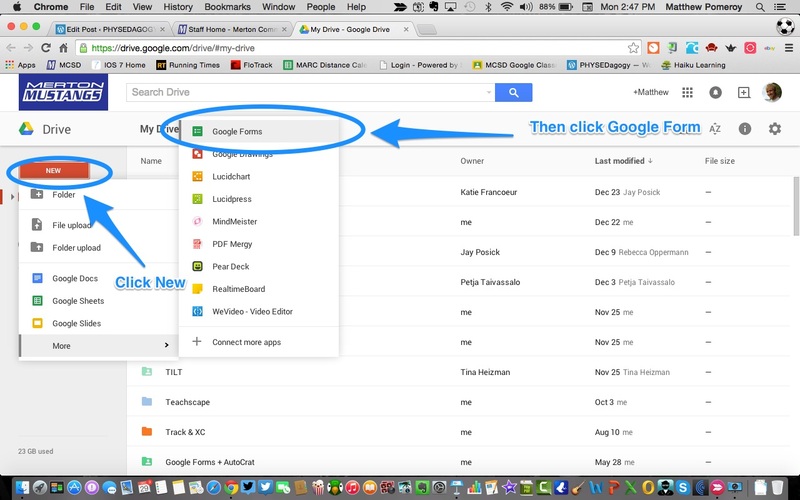 Here is a video I created to help you with creating your first Google Forms too! Check it out! When will the video be available for viewing?